If you're wondering how Steven Tyler ended up alongside Jennifer Lopez and Randy Jackson on "American Idol," it looks like you can thank his bandmates. In a new interview with Rolling Stone, Tyler reveals his true motivation for accepting to high profile television gig. "Did I take this job to show the band?" 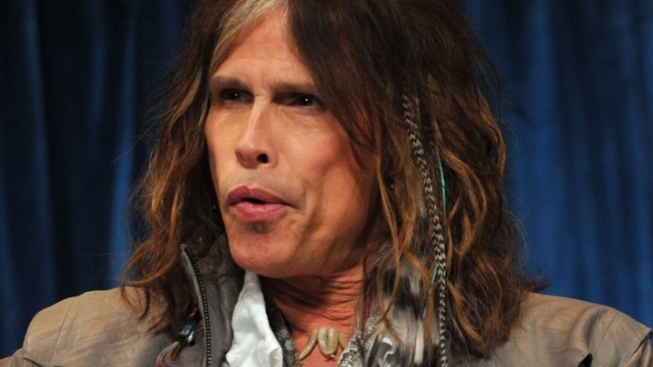 "F***, yeah," says Tyler, after explaining how the rest of Aerosmith had threatened to kick him out of the band. "Not to show them, but that I can't be held hostage anymore. I will be my own hostage. The band can't throw me out." Later in the interview, Tyler doesn't hold back when explaining what went wrong when Aerosmith attempted to record a new album in 2008. "Joe [Perry] was high and he couldn't play," says Tyler. "I couldn't sing, really, because I was snorting everything, and it [messes] up your throat. It was the wrong time." Not only is it clear that Tyler has not totally abandoned his rock star ways, he also offers up a typically Steven Tyler-esque critique - part inappropriate, part heartfelt - of the "American Idol" hopefuls.